Big Bus Tours was a business that was stuck in the past, using time-consuming methods to handle operations. When they decided to invest in labor management tools, there was a huge difference across the board with the overall happiness of the staff and management team. 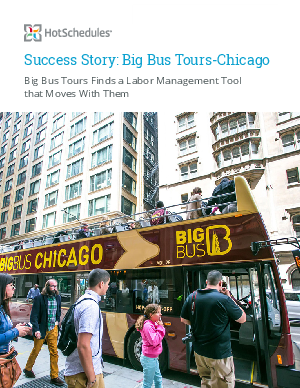 With the ability to clock in and out remotely, assign and track employees and automate payroll input, HotSchedules has become an integral part of the way Big Bus Tours runs its hop-on-hop-off business. Download now to learn more!